It's so easy to become really comfortable with where we are, instead of acting on the calling Jesus clearly left us with: go and make disciples. There's tons of awkward conversations that could happen, hard questions could be asked that leave us stumbling. However, Jesus is bigger than my inadequacy to explain his greatness and love, so let's set our fears aside and bravely share Jesus and share his hope. Here are a few songs that have been convicting me of that recently, and I'll explain the order of the songs (does anyone else feel really strongly about song order in a playlist? No? Just me?). 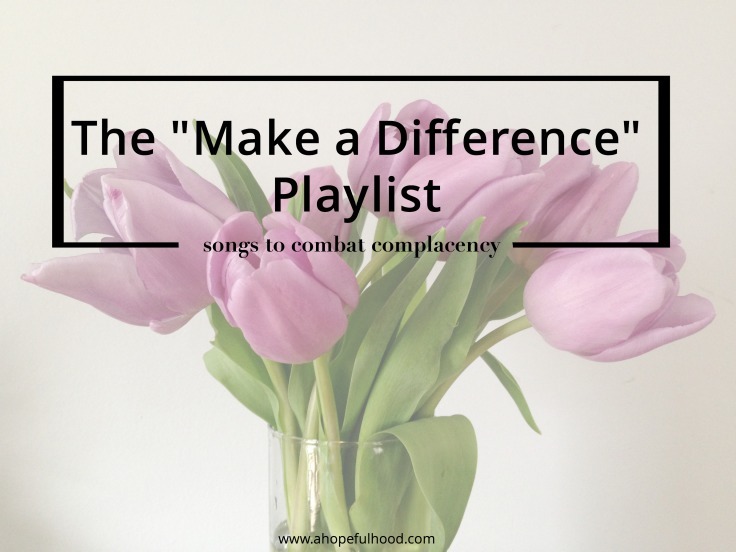 --The playlist finishes out with where our focus needs to be when we reach out to others--on Jesus, who sustains us: Take these hands and lift them up / For I have not the strength / To praise You near enough / For I have nothing / I have nothing without you. If you like playlists, check out my worship playlist to start the morning! What have you been listening to recently? How has God been calling you to get outside your comfort zone?